Built from 26 gauge galvanized sheet steel for long life and sanitation, these quality nest boxes are built to last for decades. Nesting area is 10″ wide x 12 1/8″ deep x 12 1/2″ tall for medium sized birds. The door opening is 8 3/4″ x 9″ tall. Overall size is 31″ tall x 20″ deep with the perches extended. Widths are 10″, 20″, and 30″. Angled top to prevent roosting. Open back in case you want to add a door outside to gather eggs without entering the hen house. The perches are constructed of 3/4″ wide steel bars with a 2″ wide Alder step. The perches will fold up out of the way for cleaning or to prevent night time roosting in the nest boxes. 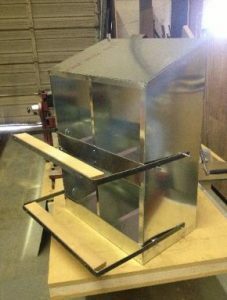 Removable bottom panels for easy cleaning and 3″ tall front and back panels to prevent the hens from scratching out the bedding. The perches can be fixed in place although you might have to ream out the bolt hole in the sheet metal side of the nest box if the holes don’t line up perfectly. Sanitizing is super easy, just pull them up and off the screws or nails used to hang the nest box and take them outside to power wash or hose them off with the garden hose. rivets or bolts, just tell us which fastener you prefer when ordering. perch extended is around 20″. Overall size is 31″ tall x 10″ wide x 12 1/4″ deep. Complete depth with perch extended is around 20″. rivets or bolts (we provide, tell us which fastener you prefer). Hanging strap, triple layer of 26 gauge galvanized steel. You have seen the other nest boxes online with the plastic panels and yes it is much cheaper to produce using plastic panels for over half of the nest box but have you ever seen plastic hold up long term? Galvanized sheet metal will last for decades even in a harsh environment, it won’t tear like a plastic panel will nor will it get brittle at low temperatures, nor will the fasteners pull through galvanized sheet metal like the plastic will do. 100% galvanized feeders are just sturdier overall and more rack resistant. The bottom panels are easily replaced if ever needed, just slip in a new bottom panel. Don’t want to spend time looking for a pop rivet gun? We can add one to the shipment for $10.00 Be sure and tell us when ordering to prevent additional freight charges. They are handy things to have around the home.